A Super Concentrated Odor Counteractant & Space Spray. Smart Scents is a super concentrated odor counteractant and space spray. Unlike competitive scents, Smart Scents will not leave behind any sticky residue to attract dirt. Use it to enhance the scent of your prespray or use it as a room freshener/space spray. 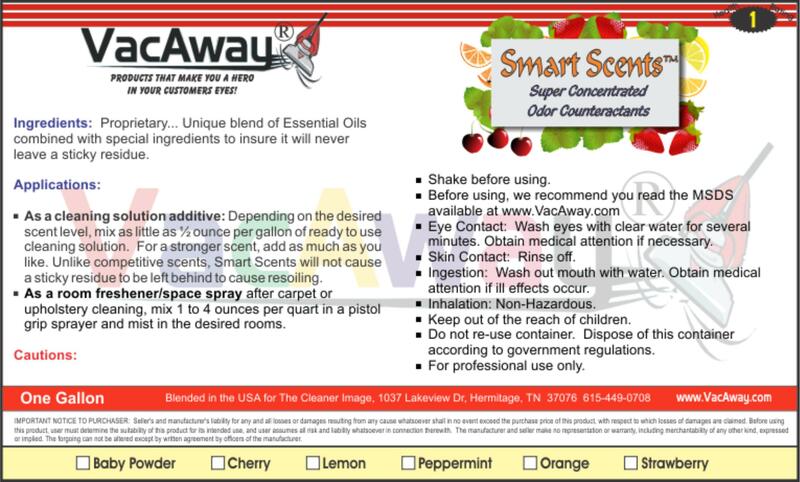 Smart Scents is available in Baby Powder, Cherry, Lemon, Peppermint, Orange and Strawberry. See MSDS and label for more information. From J Lodico of Elizabethton, Tennessee on 8/22/2017 . Love the smell and helps tremendously in carpet cleaning no more stale or wet smells from carpet. Used it in a day care style facility and 5 days later could still smell. Will definitely use this for every carpet clean. From Larry Henson of Daphne , Alabama on 3/8/2017 . I absolutely love using this product and get a lot of compliments on its smell. From matthew butler of yuma, Arizona on 12/16/2016 . I love being able to add this my cleaning solution without worrying about effecting it's ability to clean, and not having to add additional moisture and time by spraying odor counteractant after cleaning. They're extremely economical and customers absolutely love them. From Anonymous of El Paso , Texas on 4/30/2016 . If your looking for a quality deodorizer for low moisture cleaning this is good pick it will fill the whole area with a good scent but it's not too strong that your customers will complain I tried others and this is by far the best one for VLM that I currently started using.